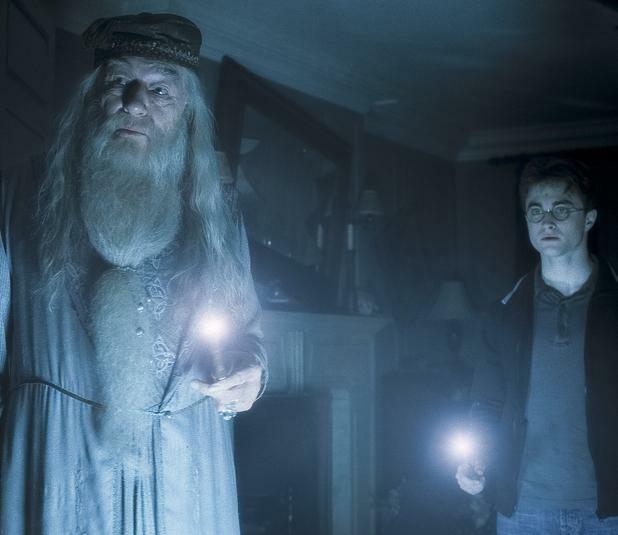 Could ‘Harry Potter’ give rise to a new religion? Michael Gambon as Professor Dumbledore (left) and Daniel Radcliffe as Harry Potter. The best-selling book series by J.K. Rowling is now the basis “Harry Potter and the Sacred Text,” currently the most popular podcast on the iTunes spirtuality and religion charts. The show, produced by two Harvard Divinity School graduates, is downloaded about 100,000 times a week. Could Harry Potter become a spiritual leader? A Cambridge podcast treats the boy wizard’s story as holy and reflects on life’s big questions using the seven-book series by J.K. Rowling as a guide. The online show, “Harry Potter and the Sacred Text,” currently holds the number one spot on iTunes’s religion and spirituality charts, ahead of best-selling author and televangelist Joel Osteen. Launched in May, the 25-minute Potter-cast draws about 100,000 listeners a week. Cohosted by Vanessa Zoltan and Casper ter Kuile, graduates of Harvard Divinity School, the podcast is resonating with fans, many of whom fell for the books as children and have always felt a special kinship with the characters. The show is recorded weekly at Harvard as the hosts thoughtfully examine passages from the text. Among the questions the podcast seeks to answer: What would Harry Potter do? They are quite sincere. Part of their weekly practice is to check cynicism at the door and encourage listeners to live with compassion and joy. They discuss a chapter each week. Now 17 chapters into “Harry Potter and the Sorcerer’s Stone,” the first book in the series, the hosts have already discussed bullying, regret, and white privilege. It isn’t the duo’s first time reading the series. Before it was a podcast, it was — and continues to be — a book club in Harvard Square held every Wednesday night at 7 p.m. in the Humanist Hub off JFK Street. The book club started last fall and weekly drew between 20 and 30 attendees. This year, Zoltan and ter Kuile, 29, passed the torch to four eager Potter-heads while they focus on the podcast. In the podcast teaser, ter Kuile, a Ministry Innovation Fellow at the Divinity School, makes a poignant statement. Aside from the Bible, the Koran, and a few classic novels or biographies, “Harry Potter” is one of the most requested book series of Guantanamo detainees. It’s also considered the best-selling series of all time with more than 450 million copies sold. The listener demographic runs the gamut of age, gender, and background. On social media, conversations based on the podcast are ongoing. “. . . Your podcast has given me the opportunity for self reflection, which I don’t do frequently enough. You’ve created conversations around our dinner table and at my office,” commented David Earl on the podcast’s Facebook profile page. “Decided ‘Harry Potter and The Sacred Text’ is my religion,” @annadarria tweeted. Decided "Harry Potter and The Sacred Text" is my religion. The podcast conversation usually isn’t planned. The hosts have employed the Jewish practice of Havruta, in which a religious text is interpreted by two people asking a question and discussing possible answers. They’ve also invoked the devotional practice of a 12th-century Carthusian monk that involves choosing a line from the text, reading it four times and asking questions of it. They recently focused on what Hermione was thinking when she was cornered by a troll in the 10th chapter of “The Sorcerer’s Stone.” Many months from now, they will discuss one of Zoltan’s favorite moments: when Harry walks the woods to confront the evil Lord Voldemort in the final book. There, as Harry contemplates his mortality, the 17-year-old wizard stops to smell the grass. And as for Rowling’s new plays, “Harry Potter and the Cursed Child Parts I & II”? They’re not included in the podcast. Because of incorrect information provided to the Globe, an earlier version of this story misstated the number of weekly downloads for the podcast. It is about 100,000.